You will need multiple copies of this page. The number depends on how many blocks you will be making. Four foundations are needed to make one block. 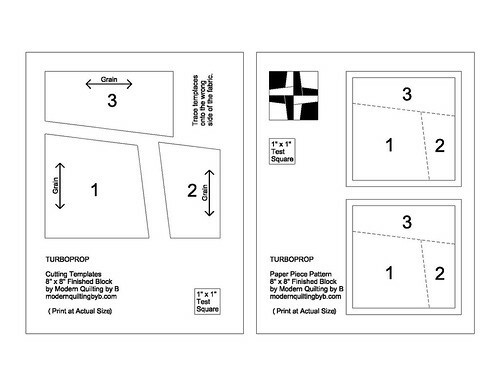 There are two foundations printed on the page so two pages will be needed for each block. 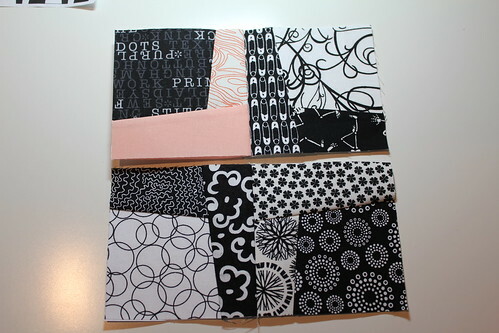 My quilt has 35 blocks so I need to print 70 pages. 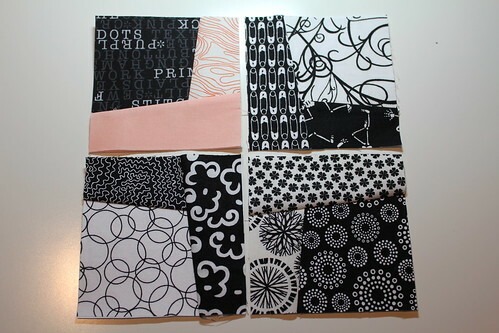 Once that is complete, we can start sewing! 1. Cut out a foundation template. Rough cutting is fine, trimming will be done later. 2. 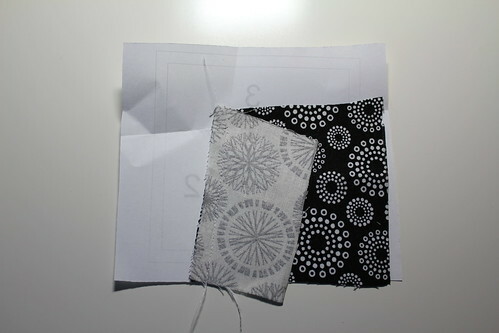 Crease the template along the sewing lines, extending the creases to the edges. 3. 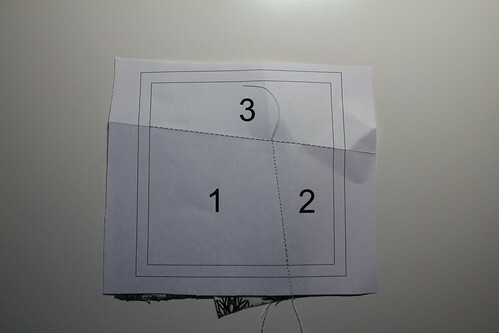 Turn the template over and place piece #1 face up into position, being sure to overlap the crease lines by at least 1/4''. 4. Place piece #2 face down onto piece #1 aligning the edges to be sewn. 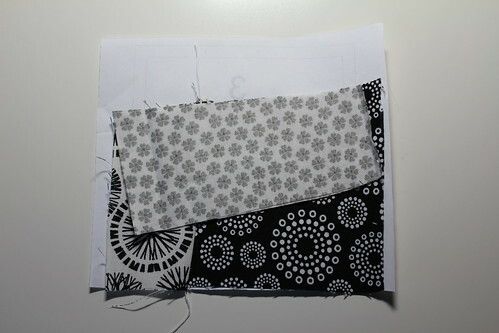 Temporarily hold the template and the two fabric pieces into place either by pinching, pinning or basting. 5. 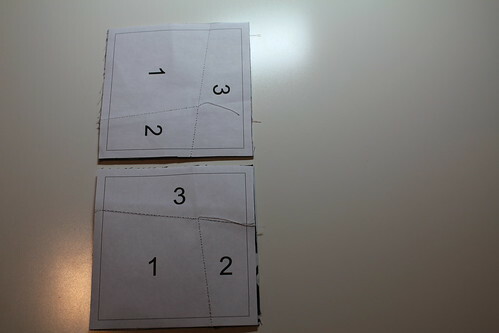 Turn the foundation and the fabric pieces over and with a very small stitch, I use a 1.5, sew along the seam line. 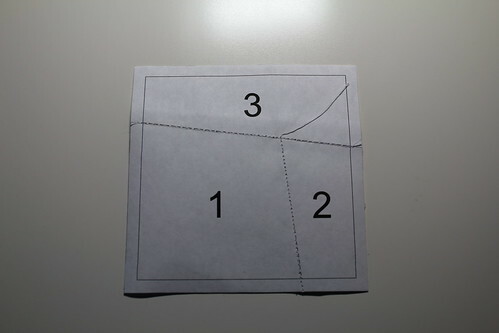 Yes, right through the paper and the two pieces of fabric. 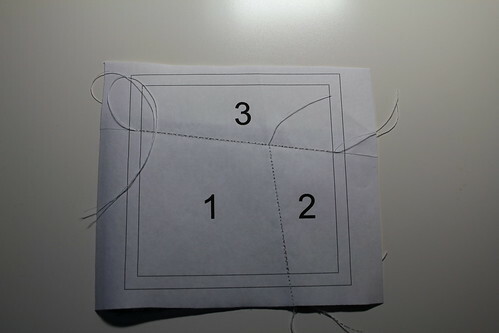 You may extend the seam line to the edge of the paper as this will help to make the block more secure but be certain to NOT cross over the other sewing lines. 6. Turn the assembly over and press the seam flat. If you wish, you may trim the seam allowance. 7. Turn the assembly over and press open. 8. 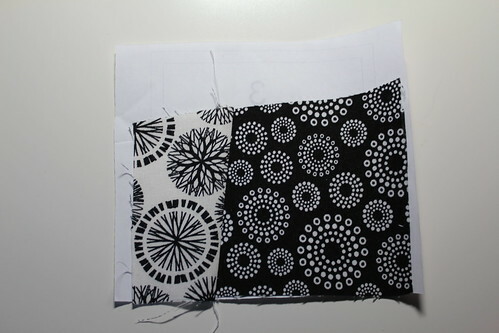 Place piece #3 face down onto pieces #1 and #2, aligning the edges to be sewn. Temporarily hold into place either by pinching, pinning or basting. 9. 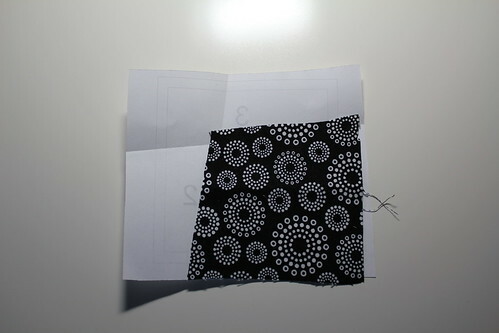 Turn the assembly and the fabric piece over and sew along the seam line. 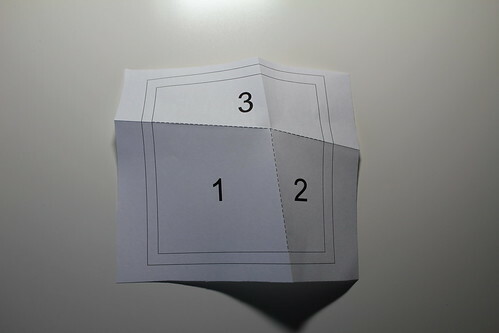 You may extend the seam line to the edge of the paper if you like. 10. 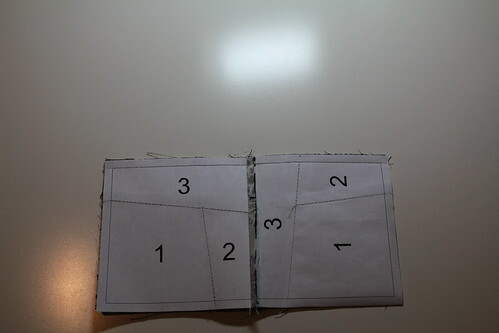 Turn the assembly over and press the seam flat. Trim the seam allowance if you like. 11. Turn the assembly over and press open. 12. Turn the assembly over and trim the edges. 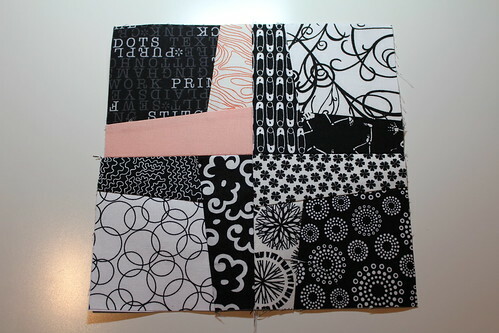 This completes 1/4 (quadrant) of the block. 13. 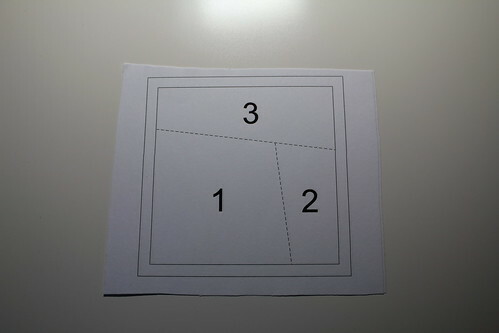 Make three more quadrants and arrange them in block formation. 14. 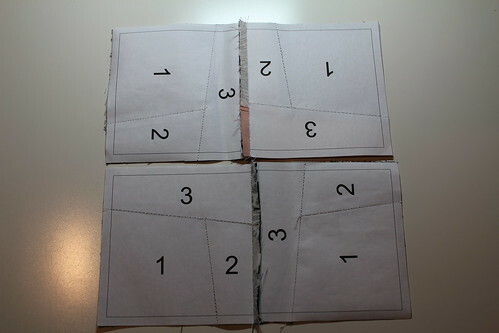 Flip the right quadrants onto the left quadrants and sew the along the edge to make half blocks. 15. Tear the foundation paper away from the seam allowances. Press one seam allowance to the right and the other to the left. 16. Turn over the halves. 17. 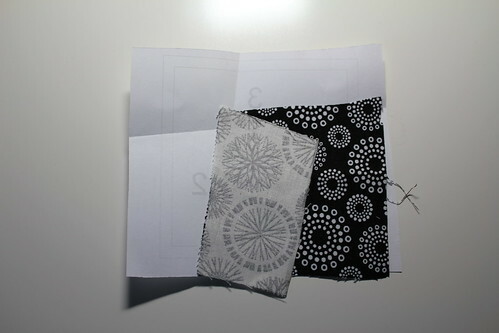 Flip the top half onto the bottom half and sew along the edge to form the block. 18. Tear the foundation paper away from the seam allowance and press to one direction. 19. The block is finished and it looks great. 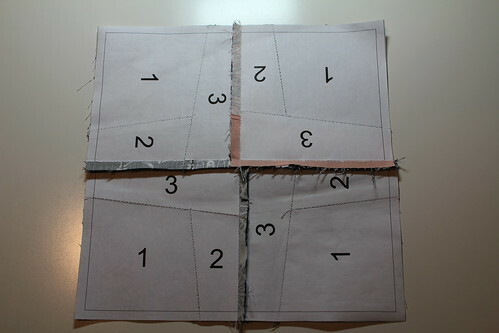 I prefer to use the foundation piecing method in lieu of traditional piecing methods whenever I can. 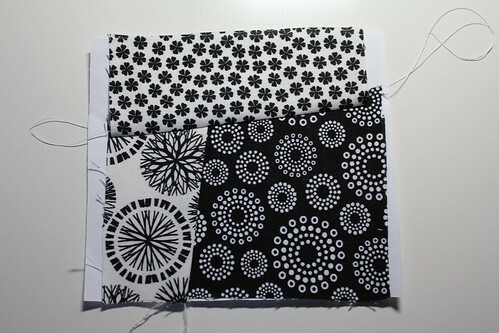 I appreciate accurate results and I particularly like how the fabrics can be rough cut without much fussing. This saves a lot of time. 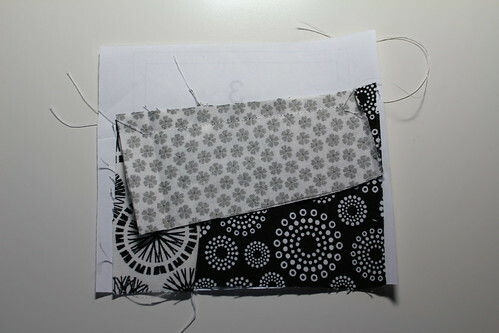 The accuracy of the block comes exclusively from the sewing; just be sure to sew on the lines and your blocks will look great too! Stop back next time and we'll work on top assembly, batting, basting, quilting and binding.